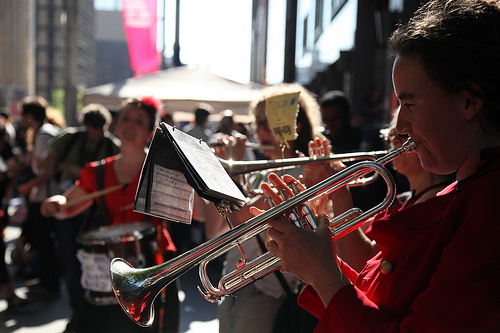 Around a thousand people converged on Martin Place in Sydney’s CBD for the Occupy Sydney protest on Saturday October 15. Martin Place is home to the Reserve Bank of Australia, across the road from the state Parliament and nearby are many major banks and corporate headquarters. 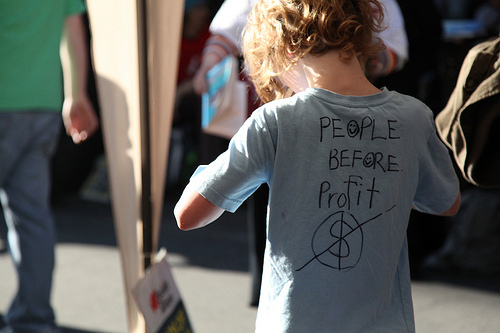 Protesters spoke out against corporate greed and called for economic justice. Speakers from the crowd spoke about the plight of refugees, and Premier Barry O’Farrell’s industrial relations changes and their impact on public sector workers. The rapidly expanding coal seam gas (CSG) industry and its environmental and social impact was raised and a vote was taken to fully support the protest against CSG taking part in Martin Place on Sunday October 16 as part of the Lock the Gate National Day of Action to defend water against CSG. 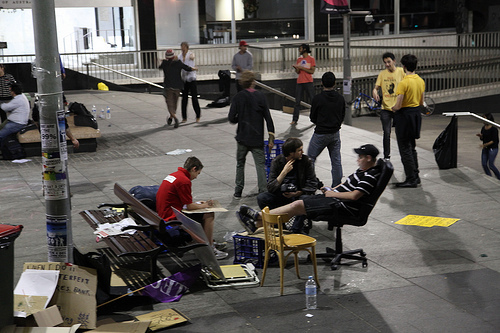 A peaceful camp was set up in Martin Place for the 100–200 people who decided to camp out. 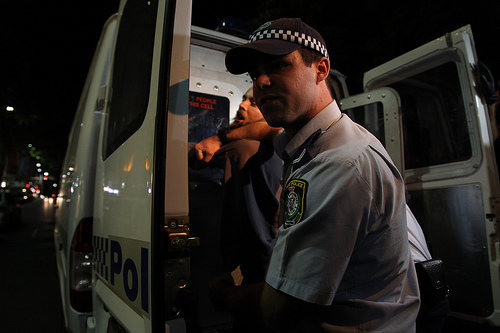 It was dismantled after dark by police officers. Riot squad, police rescue and police on horseback were all in attendance alongside regular unformed officers. Police confiscated tents, some without warning protesters. Despite this around one hundred protesters stayed camped out on the cement in sleeping bags. One protester locked on to a garbage truck, using a D-Lock around his neck, after police took his belongings. He was cut off by police rescue and arrested. 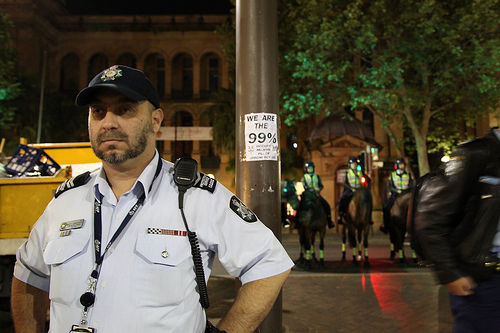 Police presence diminished and only a few remained amongst the occupy Sydney protesters in the early hours of Sunday October 16. Protesters enjoyed music, a game of cricket, and a kitchen was set up to feed the camp. Placards read slogans including ‘Occupy Sydney, not Palestine’, ‘You ask why, I ask why I have to protest’, ‘Robin Hood was right’, ‘You can’t eat money’, ‘We are the one we have been waiting for’, ‘If not now, when? 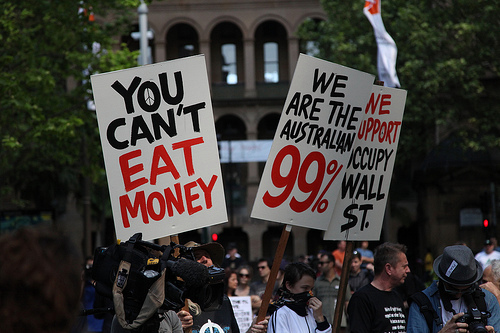 If not us, who?’, and ‘We are the Australian 99%’, sloganised at the Occupy Wall Street protest to point out that the majority of society’s wealth lies in the hands of 1% of the population. 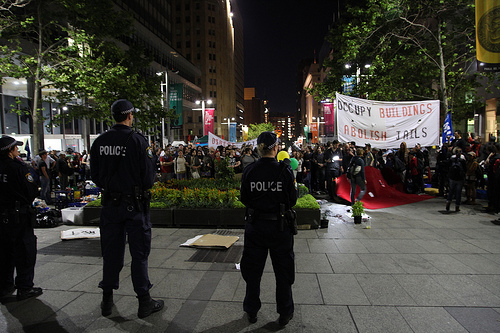 Occupy Sydney is part of the global occupy movement, which started in New York on Wall Street, inspired by uprisings in the Middle East and parts of Europe such as Spain. It is a global movement against economic injustice and other societal inequality. Chained himself to a garbage truck? Sigh. Not much going upstairs I guess. did more than you though didnt he. Pay no attention to EnGy, he live in a bubble, quite literally if you look at his website. Given the breadth and continuity of the Occupy protests (particularly in the US)coupled with the resurgent financial crisis in Europe, I am wondering if people think this will be seen as a defeat for the proponents of neoliberalism and if so will they adapt their tactics but continue to push a similar message? and what is that in English????? What a total waste of time! 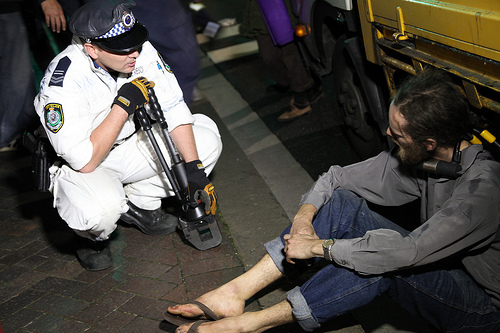 All around Sydney people sleep ‘rough’. Discrimination is rampant in our society.